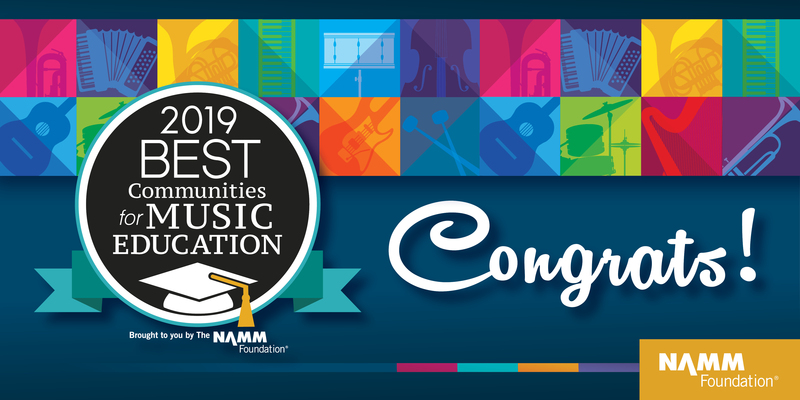 Congratulations to the 623 school districts and the 98 individual schools that received the national recognition for their support for music education as part of the core curriculum. A complete list of districts and schools can be found below. Spread the news! We encourage you to share this national recognition as widely as possible with your local media — in print, broadcast and online stories. To help you with media outreach, to raise the visibility of your music education program and to celebrate this important award from The NAMM Foundation, we are providing a promotional toolkit. The kit includes PR instructions, templates of press materials and downloadable logos, a certificate, a poster, a banner and social media assets. The NAMM Foundation's Best Communities for Music Education (BCME) is a signature program of The NAMM Foundation that recognizes and celebrates school districts and schools for their support and commitment to music education and efforts to assure access to music for all students as part of a well-rounded education. What is the difference between the Best Communities for Music Education and SupportMusic Merit award? The BCME award is for a district to be acknowledged that serves students across grade levels and multiple schools. The SupportMusic Merit (SMMA) award is for an individual school to be acknowledged. It is a “school-only” distinction and can be a charter, private and parochial school seeking the designation. Can I win both the BCME and the SMMA designation? No, you must apply on behalf of your school or district. If your school is part of a district, we suggest you work with the district to be considered for a BCME award. Will multiple applications for my district or school be considered? No. Only the first application per district or school will be considered so please coordinate with the other administrators. Due to detailed questions, participants should allow approximately 30-45 minutes.